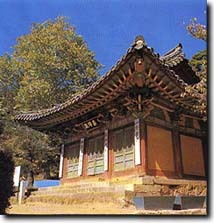 This temple was built by buddhist priest Ado-Hwasang in 381, the 11th year of King Sohsurim(r.371-384) of the Goguryo period (37 B.C. - A.D. 668) and named Chinjong Temple. It was renamed Jeondeungsa Temple, meaning the temple of the inherited lamp, after Princess Chonghwa, the first wife of King Chungnyol (r. 1274-1308) of the Goryo Dynasty, donated a jade lamp to the temple in 1282. 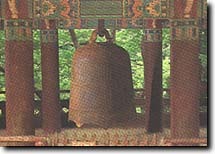 The Main Hall and the Yaksa Hall have been designated treasures as has the temple bell. Also in the compound are the sites of an archives where historical records were kept and a library, Sonwonbogak, where the genealogical records of the royal family of the Joseon Dynasty were kept. 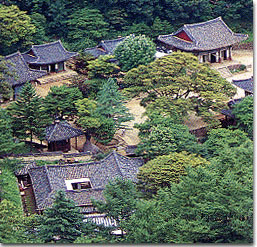 The latter site is important as Sonwonbogak was built on the site of Changgyonggak, the library in which some 80,000 wooden blocks of the Tripitaka Koreana were made and housed before they were moved to Haein Temple in Gyongsangnamdo Province.